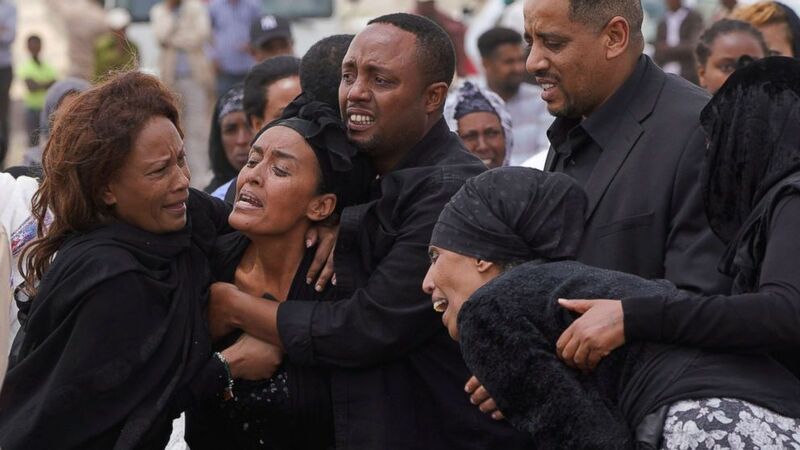 Analysis of the flight data and cockpit voice recorders from Ethiopian Airlines Flight 302 began Friday in Paris, the airline said, beginning a process that could provide new clues about what caused the crash that killed 157 people aboard the Boeing 737 MAX 8 Sunday, and resulted in a nearly worldwide grounding of the aircraft until its safety is confirmed. Investigators are looking into the MAX 8's autopilot functions and the training of the pilots who flew the plane, as well as a mechanical part of the control system that alters the up-and-down movement of the plane's nose, an aviation source told ABC News' Senior Transportation Correspondent David Kerley. The mechanism, called a "jackscrew," is a threaded rod in the tail section of the aircraft that affects the plane's stability. A jackscrew malfunction was a factor in the cause of another fatal crash in 2000, when an Alaska Airlines plane nosedived into the Pacific Ocean off the coast of Los Angeles. Air traffic controllers said they noticed the Ethiopian Airlines flight pitching up and down hundreds of feet before it crashed, according to a New York Times report Thursday night. The captain called in a panicked voice to ask to return to the airport, but the plane disappeared off the radar just minutes later, the Times reported. Public data from FlightRadar24 also showed the plane accelerated to high, abnormal speeds, though the reason was unclear. The new details could help fill out a picture of the plane's final moments. Data from the "black boxes," devices that house the flight data and cockpit voice recorders, not only will provide further guidance for investigators but also some first answers for the families of the victims. The National Transportation Safety Board, an independent U.S. agency that investigates transportation accidents and issues widely-respected safety recommendations, also sent three additional investigators to assist in the analysis. The Boeing 737 MAX 8 was involved in another deadly crash in Indonesia in October that killed 189 people. Key questions surrounding apparent similarities in the two planes' trajectories, both of which oscillated up and down before crashing within minutes of take-off, have caused about 40 countries to ground the Boeing 737 MAX as a precautionary measure. "Once they start reading out their recorders they'll know fairly quickly what this is ... is this a repeat of Lion Air or is this something different," Tom Haueter, a former NTSB investigator and ABC News contributor, told Kerley on "Good Morning America" Friday. Still, the 737 MAXs may not be back in the skies until late-April, FAA acting administrator Daniel Elwell told lawmakers in a briefing Thursday, according to a congressional aide. Boeing is implementing a software fix developed after the October crash and pilots will need to be retrained on it, Elwell said, according to the aide. A major question in the Ethiopian Airlines crash whether that software -- the plane's autopilot system -- might have played a role in the Ethiopian Airlines crash, as it seemed to have done in the fatal crash of an Indonesian Lion Air 737 MAX 8. In that crash, it appears the pilots failed to disengage the autopilot when the plane's nose began pitching up and down, perhaps because they were unaware of how to do so. Some pilots have complained that the information to disengage autopilot was not readily available, and others have raised concerns about the adequacy of the training process. "After the Lion Air tragedy, we learned that there was equipment on our aircraft that we were not aware of, it wasn't even in our book," said American Airlines pilot Dennis Tajer. Tajer, a spokesperson for a pilot's union --the Allied Pilots Association -- met with Boeing in the aftermath of the last crash. Rep. Peter DeFazio, the chairman of the House Transportation and Infrastructure Committee, announced after the briefing from Elwell that he would be "conducting a rigorous investigation to make sure that FAA is carrying out its critical safety mission." "Until investigators are able to retrieve and analyze information from the black boxes, it's difficult to know precisely what went wrong. Nevertheless, I continue to have serious concerns about key decisions made in the FAA's certification of the 737 MAX, and what was, and was not, disclosed to pilots," DeFazio, a Democrat from Oregon, said in a statement Friday. At least 250 flights per day in the U.S. typically use Boeing 737 MAX aircraft, according to Flightradar24. The MAX fleets in the U.S. are operated by American Airlines, Southwest and United. Because of the grounding, it's estimated at least 43,000 passengers each day will have to be rerouted on different planes. In an email to some customers early Friday morning, American Airlines apologized for the inconvenience, asked for passengers to be patient and said the airline would work "tirelessly to minimize the impact." Boeing stopped delivery of the MAX jet but will continue to build them, with nearly 5,000 planes on order. Some airlines, such as Alaska Airlines, were set to receive the new 737 MAX 8 and 9 in June. Alaska Airlines indicated it expected to get them as planned but said it was "too early to speculate on future deliveries." ABC News' David Kerley, Jeff Cook, Christine Theodorou and Soo Youn contributed to this report.